Chad Skelton: Video of Chad Skelton's talk at SFU on "Big Data"
Video of Chad Skelton's talk at SFU on "Big Data"
I had the pleasure of speaking on March 22 at Simon Fraser University's Burnaby campus as part of the President's Dream Colloquium on Engaging Big Data. It was a real honour to be included in the event, which included some amazing speakers. And it was great to have a chance, after the talk, to chat with some of the students at SFU about their experience taking part in the Colloquium. 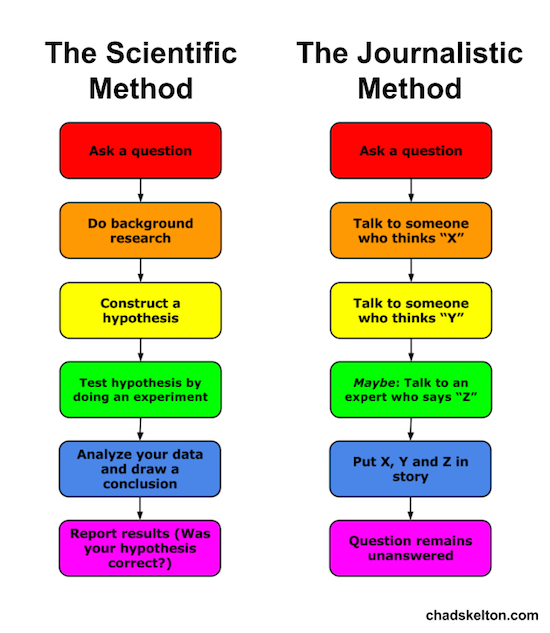 The charts above, comparing the "Scientific Method" to the "Journalistic Method", was part of my talk. Though the point I was making wasn't quite as harsh as it might first appear. I was arguing that one of the strengths of data journalism is that, practiced correctly, it can help journalists actually answer important questions, and move away from he-said/she-said reporting. The video of my talk is now available on SFU's website, and embedded below. The talk is in two main parts. The first part, from around the 5:30 minute mark to the 21:30 minute mark, is the "big picture" part of the talk, in which I talk about why data journalism is so valuable. The second part, from 21:30 to 57:30, is the more practical part of the talk, going through some of the resources available for finding open data and visualizing it. From 57:30 on is the Q&A. SFU President's Dream Colloquium (Chad Skelton) from The IRMACS Centre on Vimeo.